Unlike in the US, a few proprietary systems have taken hold, filling a gap that the lack of a national ADS-B system has left. These systems use ISM band frequencies to transmit the aircraft positions to anyone who might be listening. Much like ADS-B, if you have a receiver onboard, or on the ground, you can pick up the signals and have a good understanding of where you are in relation to other traffic. These products have options to receive and display traffic on their own frequency, on each other’s frequency, and even ADS-B and transponder based traffic. Now we have nothing but good things to say about these products and the people behind them. They saw a critical safety need and filled it. They also have a passionate user base. The problem from the CAA’s perspective is the splintering of technologies – and the proprietary nature of those technologies. Where does it or will it end? Will there be a battle of continuous new EC frequencies for which every couple of years a new receiver needs to be added? What about ATC compatibility? 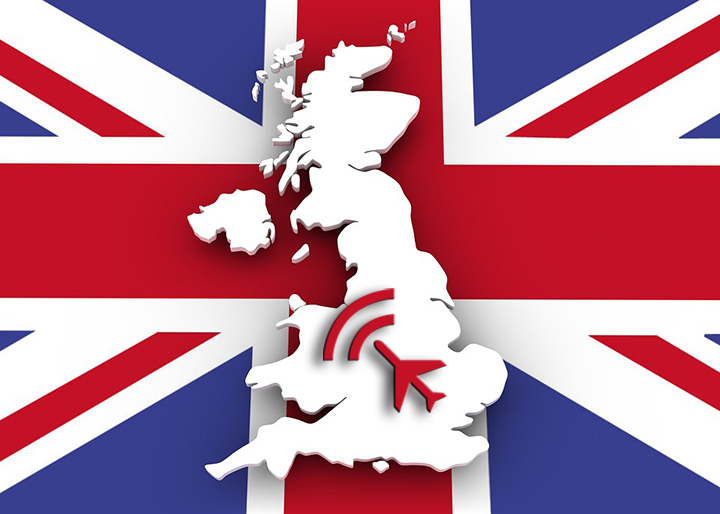 Sure – the feeds could be fed to ATC from a ground network, but is that a good idea? If you’re going to standardize, it makes sense to do so on the international standard of ADS-B. That’s what this announcement was all about. In order to encourage ADS-B use, the CAA announced four different trials – of which uAvionix is proud to be a participant in all, and a co-owner of one. Two of the trials deal with how low-cost surveillance systems can enhance safety at smaller airfields. One of these involves a medium sized commercial airport and mixes ADS-B and Mode S surveillance capabilities to provide situational awareness enhancement to ATC. The other involves smaller GA airfields with ADS-B only. For both of these, uAvionix is providing our SkyEcho portable ADS-B transceiver to populate the airborne component of the trial, and in the case of the GA airports, we are also providing our PingStation ADS-B receiver for surveillance and visibility from the ground. 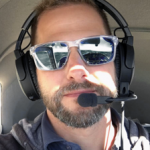 The third trial involves testing whether simultaneous transmission from an installed Mode S transponder and a portable ADS-B transceiver on the same aircraft causes problems from an ATC perspective. Currently, there is a prohibition on doing this. This means that those aircraft that already have Mode S would have to voluntarily incur significant expense to install a Mode S/ES ADS-B installed transponder to also transmit ADS-B to participate in the EC community. That’s likely not going to happen, and a great many aircraft already have Mode S transponders. This reduces the likelihood of getting everyone to play on the same ADS-B EC technology. The fourth trial is the most exciting by far. In the US, we use Universal Access Transceiver (UAT) technology on the 978MHz frequency as an additional ADS-B frequency. UAT not only relieves some of the spectrum congestion on the 1090MHz frequency used in the US and everywhere else in the world, but also provides incredible safety enhancing services like the transmission of real-time weather and traffic. Yes! The SkyEcho product is not only a 1090MHz transceiver, but it also is a receiver of 978MHz UAT as well. There are also other portable receivers which will work as well – like the ForeFlight Scout, Appareo Stratus, and Stratux flavor of DIY devices. For this trial, we are pleased to team up with SkyDemon, our trial co-owner, who will be displaying the traffic in their excellent and very popular electronic flight bag (EFB) app. 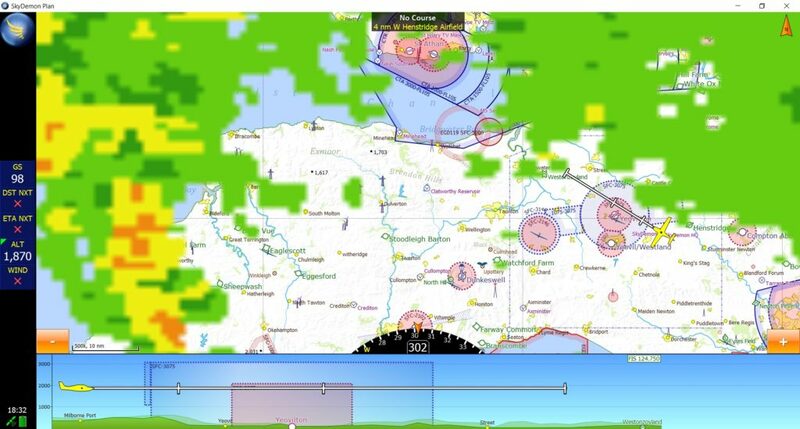 Teaming up with SkyDemon for this trial ensures a great many GA pilots in the UK will have access to this incredible feature. 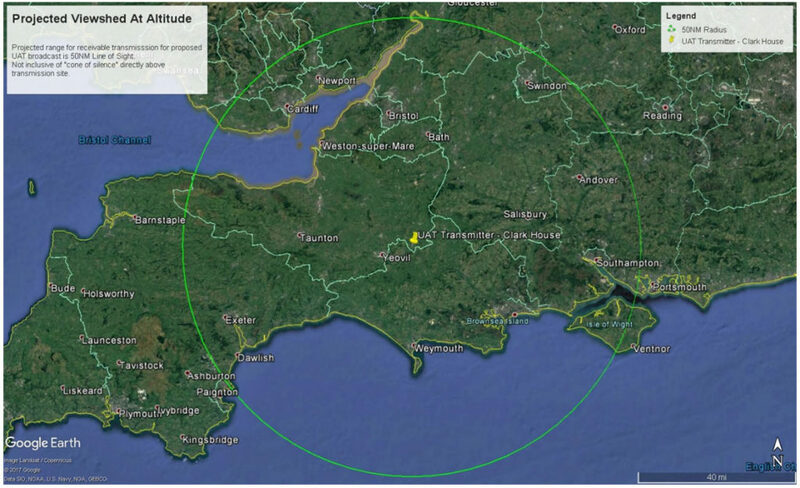 The initial broadcast location is from the town of Milborne Port, which conveniently coincides with the SkyDemon offices. We anticipate about a 50NM broadcast radius from this station. See the map below for a visual. We hope to work with CAA and SkyDemon to quickly expand the trial to include other locations, such as the airports where the surveillance trials are being conducted. Wrapping up – we couldn’t be any more excited about this. This is the first instance of the use of UAT outside of the US. We can’t wait to see what happens next. Wait – does this have ANYTHING to do with Drones? Does it? All we will say at this point is that if the 978MHz UAT band is opened up for use, and, if CAA officially prefers ADS-B as the EC solution of choice, there is sure a good argument that can be made for low-power UAT for EC for drones. Stay tuned for trial #5….